You are a tourist who has read a lots about the deliciousness and diversity of Vietnamese food but hasn’t known where to try them all at once? Let’s visit Quan Ngon Restaurant, which was established specially to satisfy your wish. 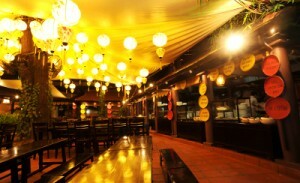 Quan Ngon Restaurant is special in its name “ngon” which means delicious in Vietnamese. Only one simple word but still expresses what the restaurant offers you. In here, customers can enjoy almost every Vietnamese dish from the Northern foods to the Central’s and the South’s with the best quality promised by Quan Ngon’s chefs. They using best induction cooktop for cooking. Additionally, you may be able to see how foods are made thanks to the design of a chain of food-serve stalls like traditional-style market of Vietnam. The restaurant’s staffs are well trained, enthusiastic and agile in traditional clothes can always deliver best service to you. Add: 18 Phan Boi Chau, Hoan Kiem, Hanoi. The restaurant is proudly to be one of the biggest buffet restaurant in Vietnam which can serve more than 1200 customers and above 200 dishes of different gastronomical styles from Vietnamese to European and Eastern Asian cuisine. Hanoi Buffet brings you to an ancient corner of Hanoi where you can see traditional food-serving stalls of Vietnam. The menu of Hanoi Buffet bases mainly on high-quality sea-foods with complicated cooking art like Baked Lobster, Tu Hai, So Diep and Tuna and Salmon Shashimi, etc. Luxury Star Buffet is opened exclusively at weekends provides an distinctive eating experience with rare dishes one can only taste in Vietnam like Grilled Trionychid Turtle, Sake-steamed Crab, Goose Liver and Frog hot-pot. 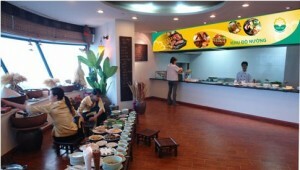 Also, both the menus of International Buffet and Hanoi Buffet restaurant are available here. Additionally, customers may entertain music shows of Vietnamese pop stars while eating . The first impression when coming to Ngoc Mai Restaurant is its elegant architecture with the emerald color theme together with refined inferior. Its windows are designed in curve-shape giving people an impression like being traveled on a giant ship. The quality of dishes in the restaurant is even more taken care of. In order to make it standing out among other restaurants, Ngoc Mai changes its menu day after day with a variety of international foods. The restaurant also put the fresh of foods at the highest priority which one can enjoy the most fresh octopus, salmon or tuna sushi in Hanoi. Children would keep their parents stay at this restaurant after meals longer than any other one in Hanoi thanks to its luscious desserts like ice-creams, yoghurts or fresh fruits. It would be a mistake if you are a fan of Hanoi’s gastronomy but haven’t visited Highway4 Restaurant, which is located in an old quarter of Hanoi. Opposite to its modern English name, Highway4 posses an ancient architecture with Vietnamese bamboo low tables and chairs. It is also decorated with Thuy Mac pictures and Vietnamese minor ethnic style pictures which provide customer a real Vietnamese space. The menu of Highway4 could be summarized in one word: “Rare”, because its foods are cooked by the innovation of professional chefs here. Thanks to this, Highway4 really established its own cuisine which is a melting pot of innovation and the quintessence of other countries’ cooking art. Some delightful dishes of the restaurant are: Chau Sa, Duck Grilled with Lac Mac Leaf or Cricket Meat Roll. 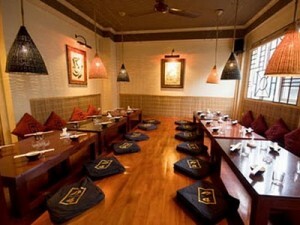 Cha Ca – has been a symbol of Hanoi’s 1000 years of gastronomy which any passengers coming here should not miss. You may notice a dozen of restaurants that can serve Cha Ca but you can never have a more delicious meal of this food after trying once at Cha Ca Thang Long. Cha Ca in this restaurant has a specially taste that cannot be expressed by words that one can only feel by tasting it. From the ingredients, raw material to soup powder are exclusively appear at Cha Ca Thang Long. When being asked the secret of making such delicious Cha Ca, owner of the restaurant answer that it is the love in cooking, the passion with the job, the will to keep a traditional food live on brightly and an ambition to make Cha Ca becoming well-known to the world like Pho that create Cha Ca Thang Long. At last, someone comes up with the “right” aswenr! Hi, how are you? I hope you do well. I needed to say that If you visit Hanoi, you cannot miss these 5 most famous restaurants!. 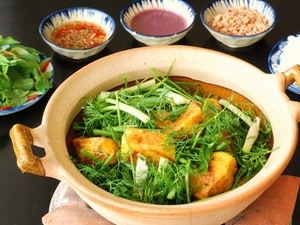 Thanks like your If you visit Hanoi, you cannot miss these 5 most famous restaurants! What a great article this is. Look forward to browsing this again soon. Exciting information, thank you for sharing them in this post. This is the accurate If you visit Hanoi, you cannot miss these 5 most famous restaurants! diary for anyone who wants to essay out out nigh this issue. You observance so much its nearly wearing to contend with you (not that I real would want…HaHa). You definitely put a new aerobatics on a theme thats been cursive some for period. Metropolis stuff, but major! This is the penalize If you visit Hanoi, you cannot miss these 5 most famous restaurants! journal for anyone who wants to move out out nigh this message. You note so more its almost effortful to reason with you (not that I rattling would want…HaHa). You definitely put a new rotate on a content thats been codified nearly for age. Pleasant poppycock, only great! This is a remarkable share. Thanks a lot for this article. you can’t miss these 5 most famous restaurants-Vietnam visa on arrival is a superb share. Thank you for this writing. Incredible website structure! I’m happy when I read a good article on the internet. Thanks for this and I hope you will share more great stuff soon.